Here, four chairs and a love seat create a cozy outdoor living area. 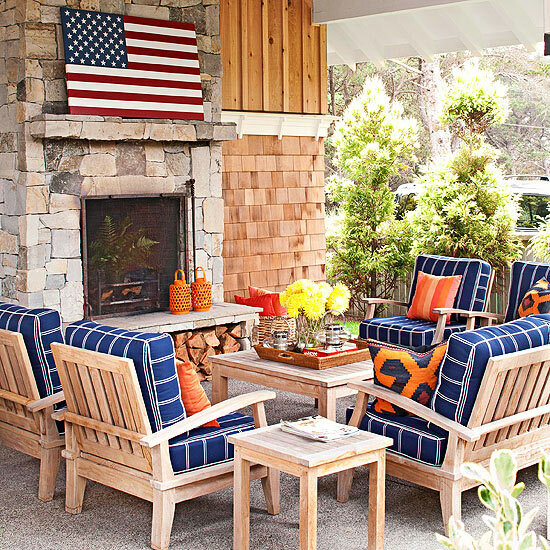 The navy-and-white striped seat cushions pair stylishly with orange throw pillows and accessories. The stone fireplace makes it easy to entertain throughout multiple seasons. This laid-back living space gets its look from bright, beachy colors. Wake up basic white furnishings with a splash of color. Bright accents, such as seasonal flowers, a decorative screen, and throw pillows, add punches of color and comfort. Here light blues, greens, oranges, and pinks pair with white for an inviting atmosphere. 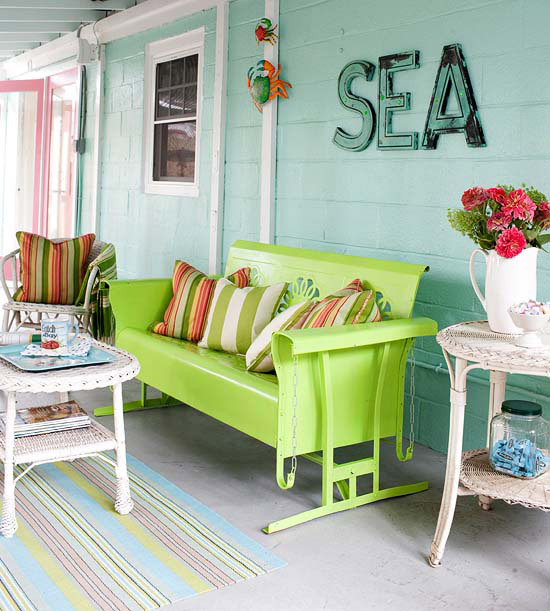 A traditional porch swing was converted into a rocker and painted lime green. The wicker furnishings are lightweight and can be easily arranged for entertaining. This porch features a cozy nook for outdoor dining ~ a casual spot to enjoy a meal in the summertime. A basic blue-and-white color palette keeps with the casual ambiance. Oversize curtains partition the space to make it more intimate. 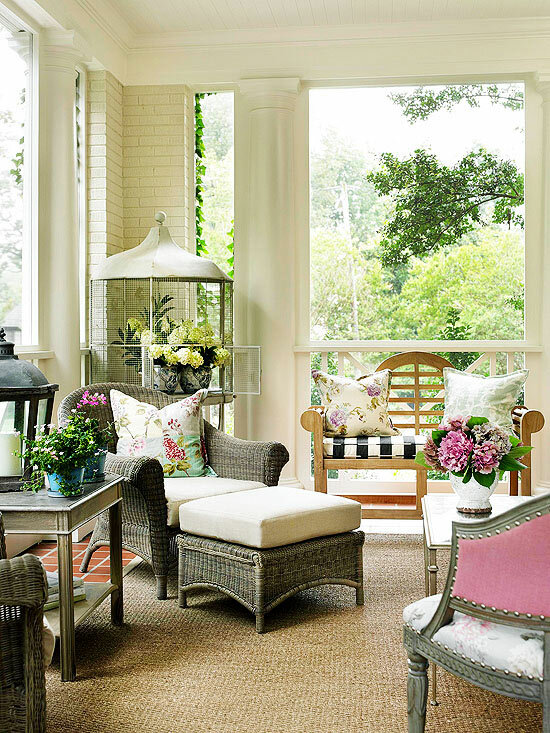 Delicate floral patterns, accents of pink, and oodles of sunshine create a feminine atmosphere on this porch. An interesting mix of seating makes the outdoor space feel more like an indoor living area. The walls and ceiling were painted white, which lends a neutral backdrop for a variety of garden-inspired accessories. 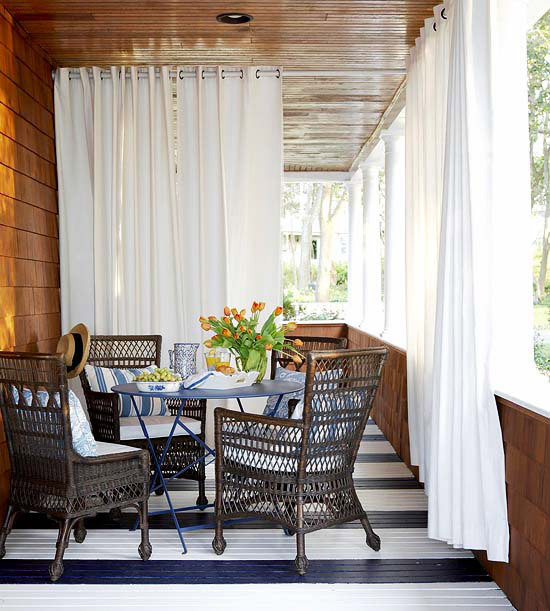 The outdoor rug beneath the seating area adds texture underfoot. A vintage birdcage placed in one corner serves as a one-of-a-kind floral display. 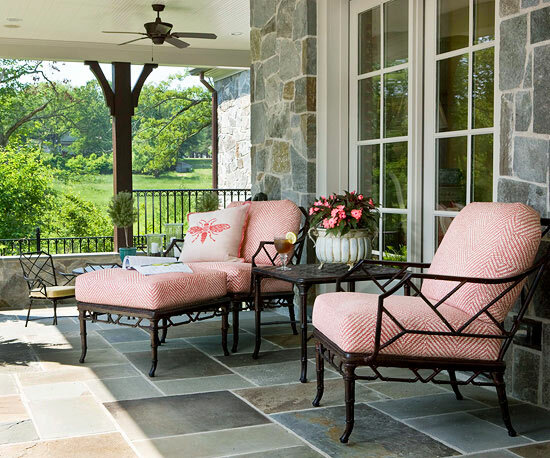 Punchy coral seat cushions add a splash of color and contrast to this porch. The sturdy metal outdoor furniture can stand up to the wear and tear of everyday living and the natural elements. Nearby, a kid-size seating arrangement, complete with a table and chairs, provides a spot for the littlest members of the family. 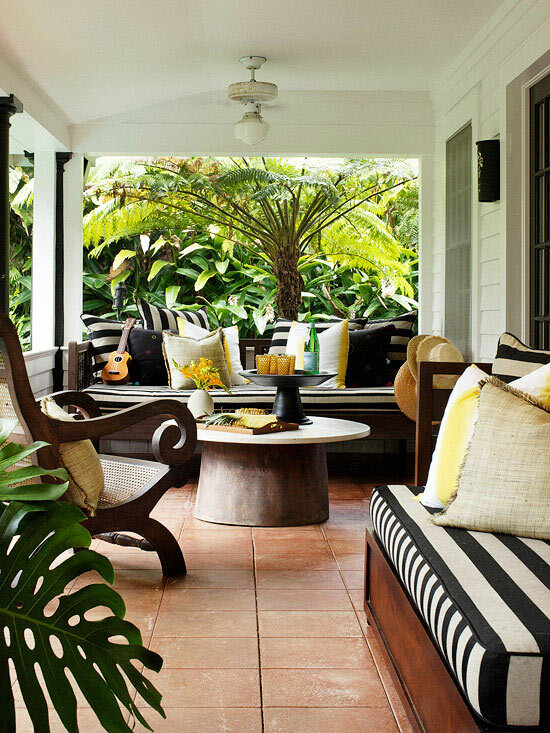 This covered sunporch makes the most of its tropical surroundings. The daybeds, outfitted with bold striped seat cushions, offer plenty of seating. Sunshine yellow accents scattered throughout the space add a needed pop of color to the strong black-and-white palette. DIY-ing: 8 EASY Garden DIY Ideas for Spring!